First things first, to kick off Mother’s Day weekend I have a nice surprise for you. See that new page added to my blog?! Free printables! I will be adding more themes and holidays as time goes on. Whether you use them for cake pops, cupcake toppers, gift tags…it’s all up to you. Hope you enjoy. Did you watch the Kentucky Derby!? I was inspired by THESE horse cookies over at Party Pinching… check out Norene’s site, some major talent & creativity happening over there! 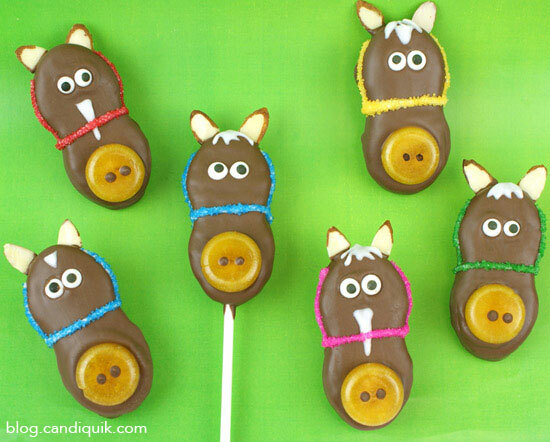 I have always wanted to make horse cake pops, but never got around to it. They’ve been hanging out on my list (I have lots of lists if you’re catching on). But the moment I saw these, I knew they had to be made NOW… I took a little different approach from Norene’s and changed a few things up. These would be perfect for the Kentucky Derby plus the Preakness & Belmont Stakes are right around the corner! Or if you or someone you know loves horses, these are perfect!! That’s another reason I made them… I have been riding since I was a little girl & have a weakness for anything “horse”. 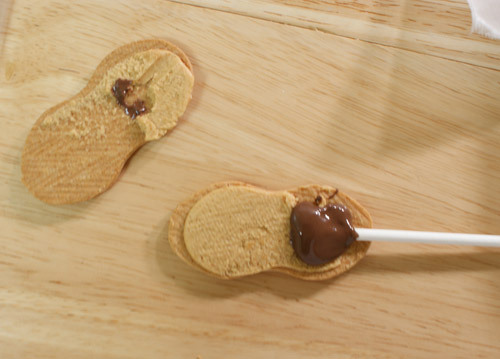 Using two utensils (I used a fork and spoon), completely cover Nutter Butter cookies in CandiQuik, let excess coating drip off and place on wax paper. Once dry, dip the very ends of 2 almond slices in the CandiQuik and press on the top of the cookie, hold until set in place. Melt Vanilla CandiQuik according to the package directions and use a toothpick to add facial markings (stripes/stars, etc. ); allow to dry. 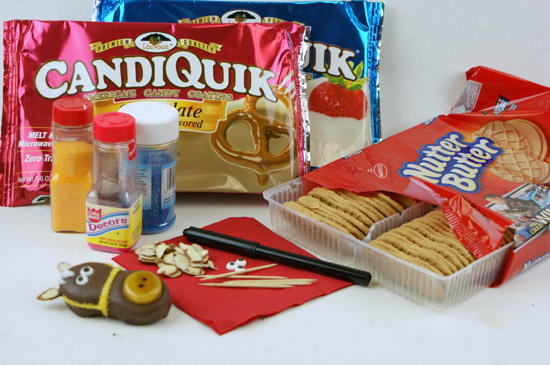 Using a toothpick and Vanilla CandiQuik, carefully draw on the bridle (should only take 3 moves: 1 strip across the nose and 2 on either side of the cookie); sprinkle immediately. 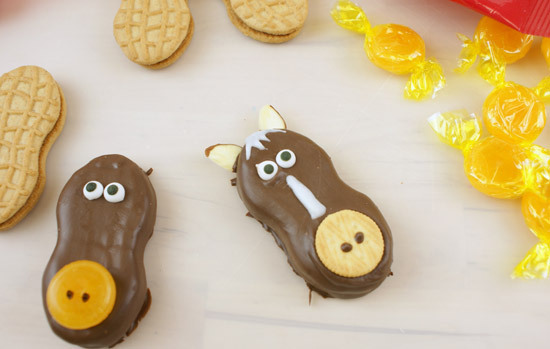 Oh, if you want to do horse POPS, simply stick the lollipop between the 2 cookies before beginning the other steps! Use a little dab of coating to help hold things in place. So cute. These awry awesome! Great use of a Nutter Butter. 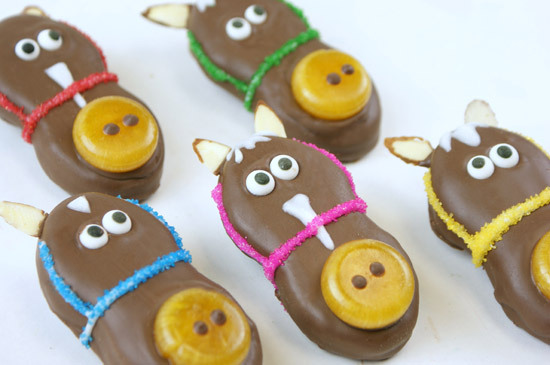 These would definitely make great treats for a Derby party. So cute! oh these are just the cutest horses i’ve ever seen! These are great and am going to make for my daughters cowgirl bday. How far in advance have you made them and how did you store them? Hi Dayna, you could easily make these a week in advance. I would store them in an airtight container at room temperature. Hope this helps!